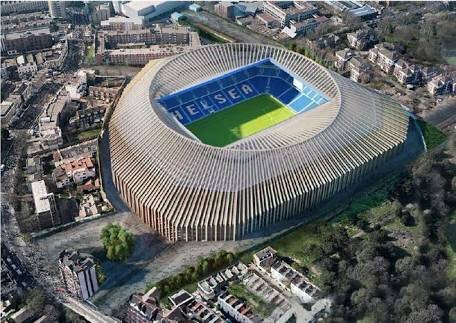 The Mayor of London, Sadiq Khan, on Monday approved Chelsea’s plans to build a new £500m 60,000-seat stadium. The Premier League leaders are planning to build the new area on the site where Stamford Bridge currently seats 41,361 fans. “London is one of the world’s greatest sporting cities and I’m delighted that we will soon add Chelsea’s new stadium to the already fantastic array of sporting arenas in the capital,” Khan said in a statement. The new ground could be completed in time for the 2021/2022 season. “Having taken a balanced view of the application, I’m satisfied this is a high-quality and spectacular design which will significantly increase capacity within the existing site, as well as ensuring fans can have easy access from nearby transport connections,” Khan added. The new stadium was designed by Herzog and de Meuron, the architects behind the “Bird’s Nest” stadium used at the 2008 Beijing Olympics and Bayern Munich’s Allianz Arena. “This is the latest significant step toward redevelopment of the stadium and the delivery of the extensive local community programme. “Further steps lie ahead, both during and after the planning process, before construction work can commence,” Chelsea said in a statement.